Staying at Nahouse Airbnb in Tulum, Mexico — monetsommers. 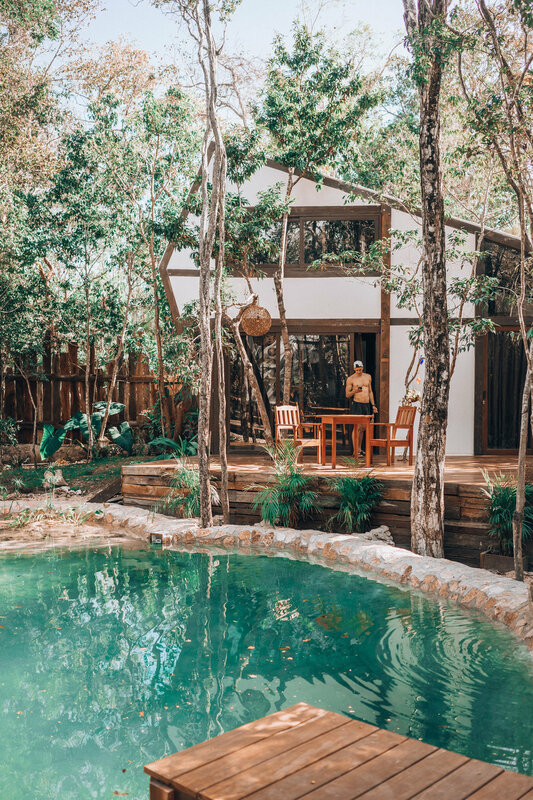 If you’ve been thinking about traveling to Tulum, then you know that the hardest part about planning this gorgeous getaway is finding the perfect spot to stay. I think I spent two weeks going through Airbnb listings before settling on Nahouse. Also, things go quick, so waiting too many weeks to book your stay isn’t recommended! Thankfully, despite my procrastination and indecisiveness, we found Nahouse Airbnb and it was the perfect spot and I would recommend it again and again. The only major thing I would have done differently is split our 7 day trip in Tulum up with 4 days at Nahouse and 3 days in the city (I’ll talk more about why later). What I loved most about our stay in Tulum with Nahouse was the remote, relaxing environment. After a full day of travels from Nashville Airport to Cancun then a 2 hour drive to Tulum, the fresh Cenote pool was calling our names. Plus, my body hadn’t acclimated to 80 degrees and sunshine, so I was desperate to try anything to cool myself off. Because the space had a full kitchen, dining table looking over the cenote, and plenty of room we spent many (actually let’s be real, most) mornings sitting outside with a homemade breakfast and fresh coffee. For those of you that do not Michael, my coffee connoisseur husband, he could happily spend vacation with a good book, a view, and a cup of coffee in his hand. Which is quite opposite of my go,go,go self. Thankfully Nahouse gave us the perfect balance. In the morning I could get up and jump in the pool, walk around the property, take pretty photos, and he could sit with his coffee and relax while I did my thing. One of my main concerns about out trip to Mexico was safety. Thanks mom and dad for reminding me on the daily to be safe ;-). But honestly, I felt very safe during my time in Tulum. I’ll write another blog post on that, but in regards to our Airbnb, I felt super safe. The host had set-up an alarm system and even had a locked safe in the room where we could put our belongings and valuables. Also, during the day someone was always on site and the cutest pup walked around and would alert if anyone came on the property (even the guest, ha)! When we were gone for a full day I never had to worry about our passports or the extra cash we left behind. Which was really nice, because I know some hotels do not have places to lock-up your things or a lot of people are coming and going on the property. As I mentioned before, the location is great because of how secluded it is, yet still so close to the city and the beaches. I totally understand someone wanting to stay on the beach or closer in to town, but when you’re balling on a budget, this spot gives you a lot of amenities at a great price. Many people recommended to us that we don’t even have a car and just rent bikes, but I’m so thankful that we did rent out car. Nahouse is off of a gravel road 1.5 miles from the city and riding a bike each day would have been dirty and not super practical. Plus, our car rental for 7 days was only $120 and we never had to fill up the gas tank. So it definitely was worth the $$. If you do anything I say, rent a car at the minimum! If you’re wanting to explore Cenotes, drive to the beach, go into the city without $$ taxi fares, then rent a car! All in all, we had such a fabulous time with Nahouse and will definitely be back if we are ever in Tulum again. I think for the price of $90/night and the gorgeous property it sits on, you really cannot beat it. I would stay in the city a couple nights as well, because there’s something about experiencing the local culture and bar hopping in Tulum.